Magical Minds Studio opened it doors in 2008, offering children 18 months and older a chance to experience hands-on creative learning through process-driven art. Over time the Studio has expanded, and we have designed an open floor-plan to cater to the growing child. Our Studio consists of a variety of creative spaces including a maker space, ceramics studio and backyard in addition to our main Studio. 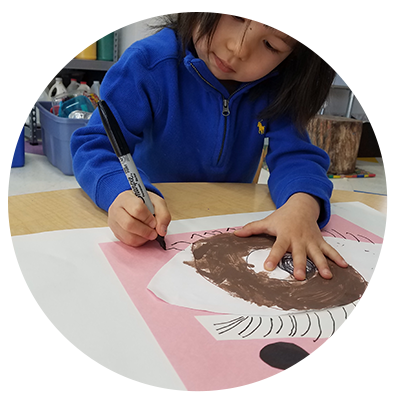 Rooted in the Reggio Emilia philosophy, our Studio encourages a love of learning through exploration. We offer a unique environment for curious minds that cultivates collaboration and problem solving skills. From toddler to middle-schooler, we champion all stages of a child’s development. Learning must focus on each child, not considered in isolation, but seen in relation with the family, with other children, with the teachers, with the environment of the school, with the community and with the wider society. Teachers are not considered protective baby-sitters, teaching basic skills to children but rather they are understood to be learners along with the children. They are valued for their experience, their ideas and their love of children. The layout of physical space fosters encounters, communication, and relationships. Children learn a great deal in exchanges and negotiations with their peers; therefore teachers organize spaces that support the engagement of small groups. All children have preparedness, potential and curiosity. They should be considered active citizens with rights, and contributing members of their families and community.